UPDATE: see this Menu Pages post if you didn’t just come from there. 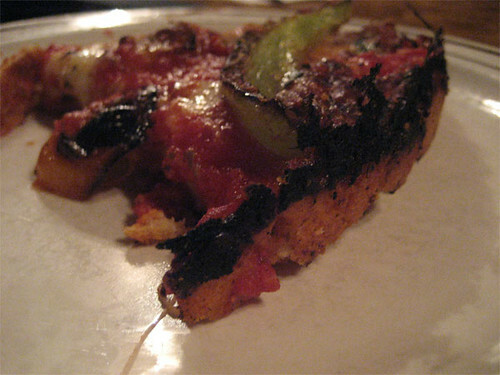 Confronted with my earlier challenge not to go all New York-snooty on us and mock pizzas as thick as Stephen King novels, Serious Eats went out and picked somebody with Chicago street cred to make their list: my quasi-doppelganger (except for the part about being a decade younger), Mike Nagrant. My verdict on their verdicts? Right choices, not right categories. We match up on a number of choices. This is no surprise, since a lot of places have sorted themselves out as the best in the foodie community and Nagrant doesn’t want to be contrarian for the sake of contrarianism. At most, you can sense that he was probably going to come to the same answer I did (eg, Scooter’s for best ice cream) but decided to provide a broader answer with more choices. And there’s nothing wrong with more choices, well chosen. Where I still have a problem with their list is that, hot dogs, burgers, late night, it just doesn’t accurately represent the real diversity and interest of dining in Chicago to me. Commenters have already called out the absence of Italian beef, which is like leaving cheese steak out of the Philadelphia one, but Nagrant had to invent (I suspect) a category for non-sushi Asian to get a Thai place in [CORRECTION: it was in the original NY list, and mine too], he has to turn Best Taqueria into Best Mexican to cover it adequately (which is like putting all Italian food under Best Pizza, basically), he has to sneak Indian food in by placing Khan BBQ in under late-night dining (as someone who’s never eaten there past 3 in the afternoon, it sure isn’t that for me) and Eastern European, which is everywhere here, and which Nagrant has written about before, is pretty much absent (there’s a category called “Eastern European Butcher,” which he picks Paulina and Gepperth’s for, both of which are, of course, Germanic and thus western European, if we’re being picky). Ignoring Eastern European is no small thing because I have an east coast friend who, first thing he wants to do in Chicago is go eat Polish food, precisely because he can’t get it there. It may not be something we think of as being as distinctive as the Bayless school of fine Mex, but it’s still a real strength of ours. In short, I think Serious Eats has somewhat missed a chance here by picking the right guy to pick the answers—but not asking the right questions, at least not all of them. The Hallelujah chorus made edible in cheese and dough. Spinach deep dish from Art of Pizza, the best pizza in Chicago. Michael, as I mentioned to you the other day. True revenge will not come until YOU post your list of Best of NYC. That’ll be tough, I haven’t been there since 1997. 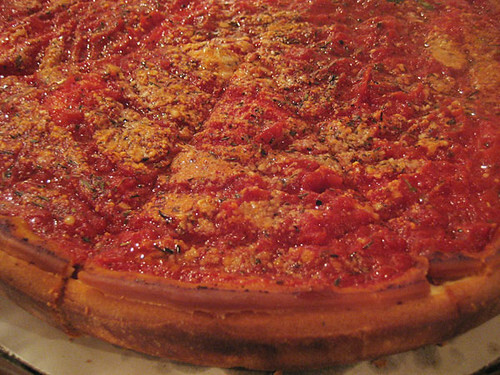 One of the best things to come out of these so called “best of” lists is that, Mike G, a guy I find I agree with almost as much or more than anybody on food has also shared his two cents on Chicago, and that my friends is a beautiful thing. We are so lucky to have such a wise deep group of people like Mike (not to mention the whole LTH crew and the Local Beet guys, dudes like Hammond, Wiviott, and Michael Morowitz, Rob Gardner, Cathy2 etc etc) who care enough to deliberate and produce so much information for people who love to eat, often for free, and with no agenda, except to find good and often responsibly produced local food. I’d add too that if anyone has the “right” questions they know where to find all of us via our email and websites and they should ask them. I tried to address some of those questions today on serious eats, including Italian Beef and Polish eats…. Also, Khan was listed under “best date spot”, not late night. And though there are some Indian dishes, Khan is actually Pakistani. If you’re looking for Pakistani, you might also want to try Bismillah on Ridge and Sabri Nehari. If folks are looking more for Indian specifically, I really like Udupi Palace and Mysore for vegetarian focused eats, Khyber pass in Oak Park, and India House downtown. Yeah, I think if I could start this topic over I would go back and look at the categories first. When I have people visit from out of town, they’re not interested in hot dogs per se, or steak, or late night, or see and be seen. They want, or at least respond best to: 1) deep dish pizza (I’ve tried taking them to Spacca Napoli and they always end up disappointed that they wasted their pizza slot on something that wasn’t deep dish), 2) big city chic or its cousin urban funkiness (I can understand why New Yorkers wouldn’t come here for that), 3) interesting Mex, and 4) immersion in ethnic neighborhoods like Devon, or Polish Avondale, or Chinatown. So to me those are our real strengths, and most likely to leave people satisfied that they’ve had the real Chicago experience. But it’s all a matter of differing perspectives. I mean, if I went to New York now, I’d want almost exactly the opposite of what I wanted the first time I went there in 1985. Then, apart maybe from Jewish deli, it was high end like I couldn’t get in Kansas. Now it’d be Uzbek, Dominican, old school pizza, whatever immigrant groups don’t come here and open restaurants. And Jewish deli.